The association was formed in 2003 after the death of Wayne Ross, WD4JPQ, whose call became the association’s call. The local repeaters have a history that stretches back to the 1970s. The 147.09 repeater came on the air in 1974 using a Phelps-Dodge Superstationmaster antenna at 750 feet on the Channel 9 tower near Greenville Boulevard and Evans Street. Soon after that a Hustler G-6 antenna was installed at 650 feet for transmit. The repeater equipment was a GE Master Pro. Four-bay dipole arrays were added in 1982 and 1983. In 1985, the 145.35 repeater came online. It used the old antennas that the 147.09 repeater had abandoned on the tower. The G-6 antenna was changed to a G-7. In August 1986, the tower was reduced in height from 800 feet to 360 feet. The two repeaters split the use of three, four-bay dipole arrays. Each four-bay antenna is fed with three and 1/8-inch rigid transmission line that used to feed the old Channel 9 batwing antenna and the 107.9 FM antenna. Those had been abandoned when the TV and FM stations moved their transmitters to the 2000-foot Grifton tower. The original 444.800MHz repeater was built by Macon Dail, WB4PMQ and Gary Ambert, AI4J in 1983. It resided at the top of Tyler Dorm on the ECU campus with the antenna center of radiation at 140′ AGL. It was moved to the WNCT-TV studios in the back of Wayne Ross’ truck in 1994. The original antenna location on the WNCT-TV tower was 250′ AGL. 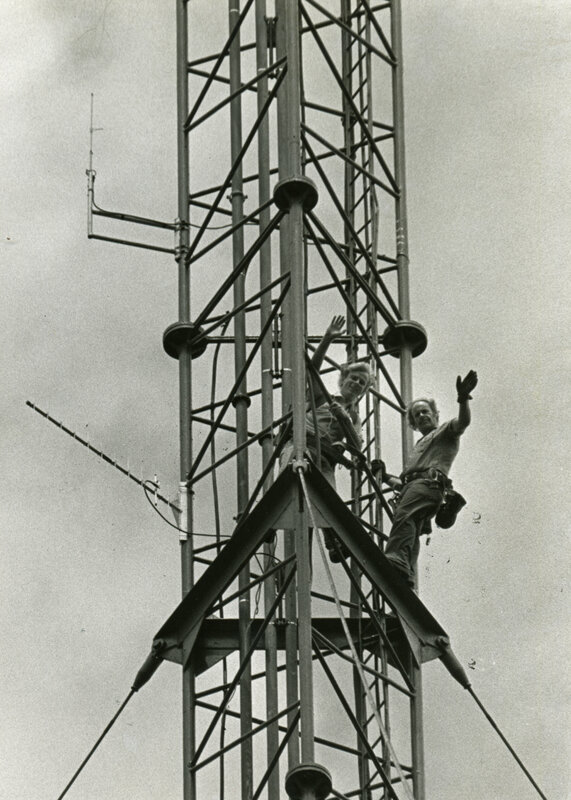 The original antenna on the WNCT-TV tower was a commercial fiber glass type which worked well until it failed due to water migration into the antenna. In order to improve coverage and antenna reliability, a new 8 bay DB products dipole array was purchased and installed in 1999. Its center or radiation is 310′ AGL. The repeater was scratch built from Hamtronics RF modules and incorporates a controller based on a QST article published a few years ago. The power amplifier and duplexer were manufactured by Motorola. The power output of the repeater is approximately 60 watts which includes duplexer and circulator losses. A GasFET preamplifier ahead of the receiver provides excellent sensitivity with high immunity to overload. The 145.35 repeater has linking into Columbia and EchoLink. The 147.09 repeater can also be linked to 145.35 and to Columbia if 145.35 is down. The Board of Trustees are John Johnson, KE4TZN; Macon Dail, WB4PMQ; and Bill Dawson WA4SLC. If you are interested in helping please each out. Murray Adams (WA4DAN) and Bernie Nobles (WA4MOK) working on the tower. Photo Credit to Tommy Forrest (N4GVK).